Carrots are good for your eyesight. Walnuts are good for your heart. Pineapple has anti-inflammatory properties. Translation: If you eat this carrot cake, you’re doing good things for your body! It’s health food! If that doesn’t convince you and you need another reason to try this cake, I’ve got a very convincing one. Cream Cheese Frosting. 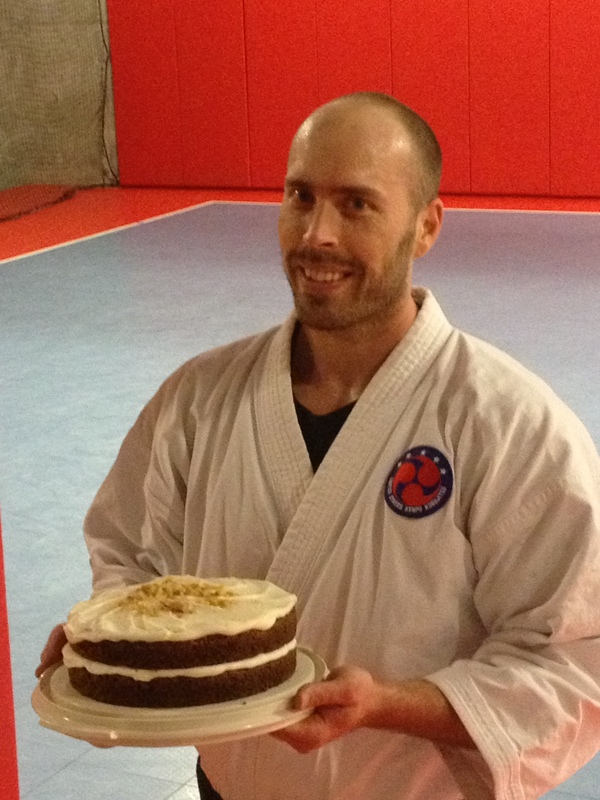 Sensei Phil didn’t have anything particular in mind for his Banzai Birthday treats. 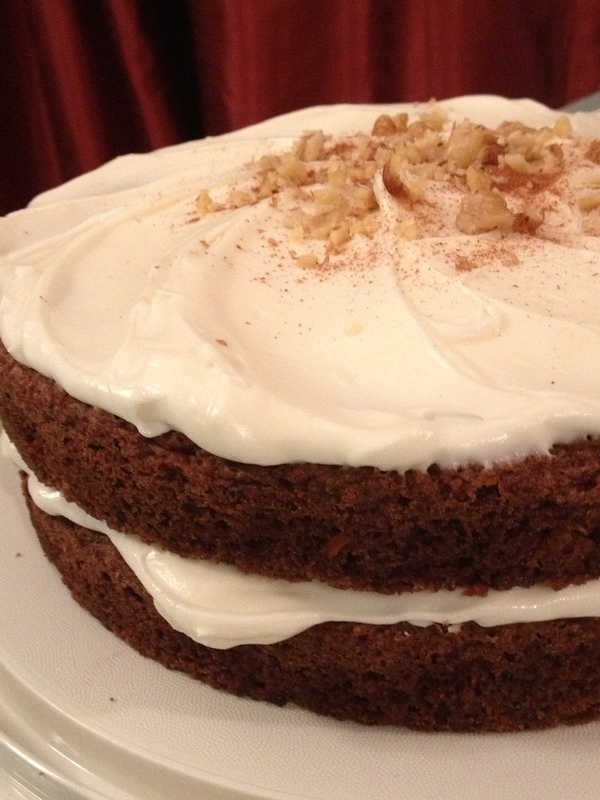 Knowing he’s not a chocolate person, I suggested one of my favorite cakes – Carrot Cake! I thought our karate group would enjoy it. The consensus was the cake is good and the frosting is Banzai-worthy! I bought already-shredded carrots in the produce section. I’m too lazy to shred them myself. You can use pecans instead of walnuts, or eliminate the nuts if there is a nut allergy. Personally, I’d add the nuts if you don’t have to leave them out. The frosting amount shown is 1 1/2 times the original recipe. What can I say? I like cream cheese frosting. If I hadn’t used it all on the cake, I would have eaten it right off the spoon. You can make 2/3 of the frosting if you want – it’ll give enough for the cakes. But why would you do that? The frosting is why we eat carrot cake, right? Make this. Eat it. Feel healthier because you ate stuff that’s good for you. Then have another piece. Carrot cake is health food, and the cream cheese frosting is just plain awesome! Preheat oven to 350F. Grease and flour two 9″ round cake pans or one 9×13 inch pan. Mix flour, baking soda, baking powder, salt and cinnamon; make a well in the center and add sugar, oil, eggs and vanilla. Mix with wooden spoon until smooth. Stir in carrots, coconut, walnuts and pineapple. Pour into pan and bake for about 25-30 minutes for the rounds or 45 minutes for a 9×13. The cake will bake up fairly dark, and the centers will sink a little. Cream the butter and cream cheese until smooth; add the vanilla then the icing sugar and beat until creamy. To frost: If using the round cakes, no need to frost the sides. Plop half the frosting on one cake and spread. You’ll have a nice, thick layer of icing. It’s OK if a little goes over the edges. Place the second layer on top and frost with the remaining frosting. Sprinkle with a little cinnamon and add a few chopped walnuts for decoration, if desired. TIP: If you’re transporting the layered cake, put a dab of frosting on the plate before you put the first cake layer on it. It’ll act like a glue to hold the cake layer in place. TIP 2: If you are one of the few people who don’t care for the thick cream cheese frosting, there’s a lighter version that’s also delish. Beat 8 ounces softened cream cheese. Beat in 1 jar (7 oz.) of marshmallow fluff. Frost your cake then lick the spoon and bowl clean!